Use the drawing and instructions below to measure your existing garage door. Take these measurements to your local installing dealer or retailer to purchase the Clopay® garage door that is right for you. Measure area labeled sideroom left and right (3 and 4) – a minimum 3-3/4″ is required on each side for installation of the vertical track for a standard extension spring, standard torsion spring and the EZ-SET® Torsion Spring System; 5-1/2″ for the EZ-SET® Extension Spring System. 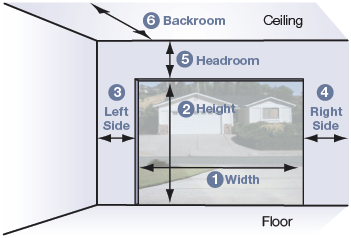 Measure area labeled headroom (5), which is the distance between the top of the door opening (jamb header) and the ceiling (or floor joist). 10″ is required for the standard extension spring or EZ-SET® Extension Spring System while 12″ is required for a standard torsion spring and EZ-SET® Torsion Spring System. If you have restricted headroom, special hardware is available. Additional headroom is required for installation of an automatic garage door opener. NOTE: If garage door height extends above the opening, the headroom measurement should be adjusted proportionately.